A kitchen utensil that is used to whip lighter food ingredients being prepared for baking or serving. Straw whisks are made of stiff straw bristles that are gathered and formed into an extended set of straw "wires" that function to whip ingredients. 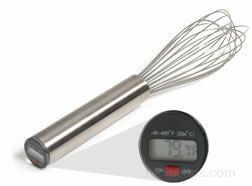 It is not a common type of whisk, but more often used by those who have found this type of whisk suited for a specific purpose. Similar whisks, known as birch whisks, made from birch branches are also available to whip light ingredients.